Ranunculus asiaticus is the most common form of this flowering bulb, however Ranunculus Ficaria ( Lesser Celandine) with its tiny rose like flowers will get just as much attention. A mass planting of these wonderful flowering bulbs will certailnly gain attention. A single bulb (actually its a corm) will give over a dozen flowers. Flowercolors range from whites to light pinks, apricots and reds. Flowering season is from spring to summer. 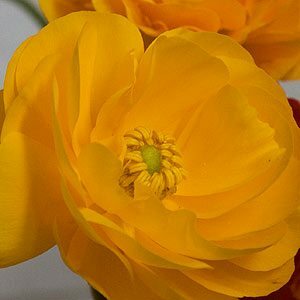 Ranunculus asiaticus (Persian Buttercup) are a tender summer flowering perennial with very pretty flowers, they spread by underground corms or bulbs. A sunny position is best in a humus rich well dug soil. R. asiaticas will reach 60cm and make a great cut flower. When planting remember that they require a cool root run, mulch is always a good idea, apply in early spring. Very little care is required unless you wish to divide older clumps, this can be done in late winter. You can dig the bulbs and give them a clean, we do not usually wash ours, rather just brush the dirt off them and just let them dry, and then then give them another clean. We store ours in a clean dry tray with good air circulation, in a cool dark corner of our garden shed. Some people use paper bags. Commercial growers do use fungicides, however we not worry about that.